With Divock Origi’s proposed move to Liverpool still in transfer purgatory, Spanish champions Atletico Madrid are reportedly willing to hijack the deal as they look to replenish their depleted striking stocks. Liverpool are currently midway through a pre-season tour of the USA where rumours of player medicals have so far failed to turn into concrete signings. 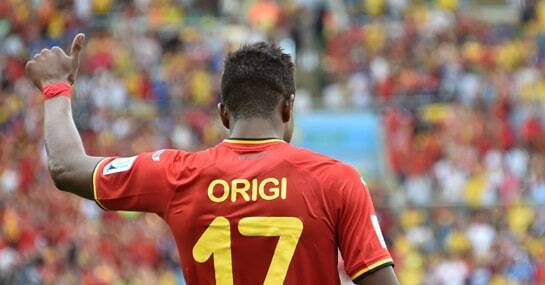 Frenchman and Belgium World Cup star Origi as deals that were virtually sewn up. However, in a new twist, Atletico’s thirst for strikers – having lost both Diego Costa and David Villa this summer – has apparently led them to Origi’s door. Even though Liverpool have supposedly agreed an £11m fee with Lille for the 19-year-old’s services, with a view to loan him back to the Ligue 1 club for the coming season, Origi remains on the market. One potential obstacle to Liverpool wrapping up the deal could be that they are awaiting the departure of Fabio Borini before they look to add one or even two more strikers. Sunderland’s £14m offer for the Italian has been accepted and this is clearly a transfer Brendan Rodgers would like to see happen after forking out £11m on the Roma man two years ago. Although Borini impressed at the Stadium of Light on loan last season, he’s never been a face that fitted at Anfield and swapping him out for Origi and Remy would be good business for the club. With Atleti now circling Origi, though, Liverpool must hope the young Belgian’s head isn’t turned before they can remedy the situation. Liverpool’s next pre-season game arrives against Greek champions Olympiacos in Chicago, where the Reds can be backed at 8/11 to bounce back from a 1-0 defeat to Roma with victory.